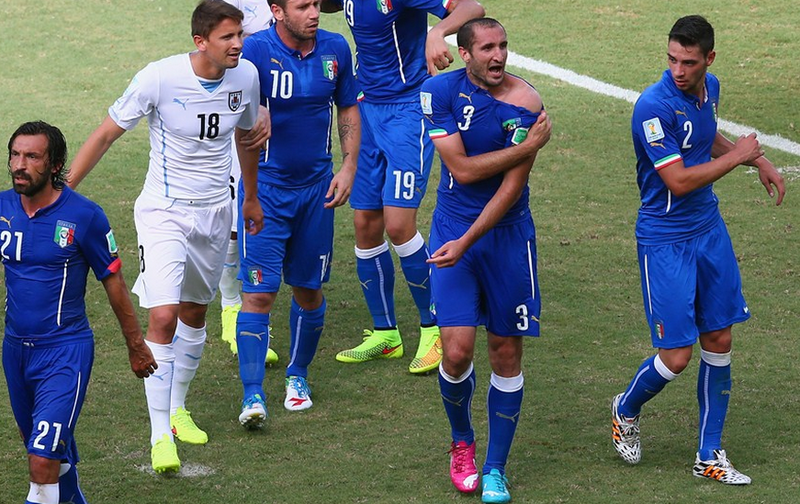 It was clear – Italy had to secure a draw to advance to the second round, but Uruguay had to win. Italy had the advantage because only ‘loss’ from the three possibilities – win, loss, and draw – could have knocked them out of the tournament. Italy went into the game with good planning. They selected three centre-halves in Giorgio Chiellini, Leonardo Bonucci, and Andrea Barzagli and two forwards in Mario Balotelli and Ciro Immobile. Such a decision was taken by manager Cesare Prandelli for the first time in the tournament. It was a clear indication that Italy would be ready for attacking the opposition goal, but that they were ready to settle for a draw if that did not work. Apart from this, they had two wing backs in Mattia De Sciglio and Matteo Darmian and three in the midfield in Claudio Marchisio, Andrea Pirlo, and Marco Verratti. Gigi Buffon stood at the goal, making it an all-four Juventus back line. The match opened to a very dull first half. There were minimal attacks from either side and the ball was mostly in the midfield with Italy dominating possession. Buffon showed why he is still amongst the best in Europe through back-to-back saves to deny the opposition twice, which eventually earned him the Man of the Match award. The second half saw some good moves from Uruguay, but Italy ably defended them. Just then came an unexpected passage in the play, with Marchisio leaving the field with an undeserved red card. By definition, a red card is to be shown to a player who poses some kind of danger or threat. Marchisio committed a foul which looked unintentional and non-dangerous. But the referee was quick to take out and flash the red card to show him the exit door, while a yellow card would have been sporting. This shaked up Italy, a mental state from which they never recovered. When they were down to 10 men, with just two regular central midfielders, Italy resorted to complete defence. With just 10 minutes to play for, Uruguay captain Diego Godin converted a set piece to a brilliant goal. After that Italy planned some swift moves, but none of them could be converted. It was saddening to see even Buffon coming up to the penalty area of the opposition in an attempt to find that one goal which could secure them a place in the pre-quarter finals. But it wasn’t to be, and the Italians were knocked out for the second successive time in the first round of the world cup finals. It is true that Italy struggled in the midfield and failed to reach the ball to the forwards. Bad refereeing also affected their plans. They were down to 10 men and they had to change their game to make up for the loss in midfield. Just then Luis Suarez bit Chiellini in the Italian penalty area, something which the referee completely overlooked. If Uruguay were also down to 10 men, the match would have become more interesting. One can only wish that FIFA will make use of technology to give instant penalties to players who make such hard moves on the pitch. It is a shame and disgrace to the game. Italy will not take any further part in this world cup, but they had their moments in the opening match against England. They were clueless against a defensive Costa Rica, and their bad tactics and bad refereeing were pivotal in the last match against Uruguay. Prandelli had another two years of contract period to bring confidence back to the team and to make them ready for the Euro Cup in 2016, but he resigned following their first round exit. With the likes of Buffon, Pirlo, De Rossi, and Cassano leaving the game soon, one can expect to see more young blood in the team in the near future. It was clear – Italy had to secure a draw to advance to the second round, but Uruguay had to win. Italy had the advantage because only 'loss' from the three possibilities – win, loss, and draw – could have knocked them out of the tournament. Italy went into the game with good planning. They selected three centre-halves in Giorgio Chiellini, Leonardo Bonucci, and Andrea Barzagli and two forwards in Mario Balotelli and Ciro Immobile. Such a decision was taken by manager Cesare Prandelli for the first time in the tournament. It was a clear indication that Italy would be ready for attacking the opposition goal, but that they were ready to settle for a draw if that did not work. Apart from this, they had two wing backs in Mattia De Sciglio and Matteo Darmian and three in the midfield in Claudio Marchisio, Andrea Pirlo, and Marco Verratti. Gigi Buffon stood at the goal, making it an all-four Juventus back line. The match opened to a very dull first half. There were minimal attacks from either side and the ball was mostly in the midfield with Italy dominating possession. Buffon showed why he is still amongst the best in Europe through back-to-back saves to deny the opposition twice, which eventually earned him the Man of the Match award. The second half saw some good moves from Uruguay, but Italy ably defended them. Just then came an unexpected passage in the play, with Marchisio leaving the field with an undeserved red card. By definition, a red card is to be shown to a player who poses some kind of danger or threat. Marchisio committed a foul which looked unintentional and non-dangerous. But the referee was quick to take out and flash the red card to show him the exit door, while a yellow card would have been sporting. This shaked up Italy, a mental state from which they never recovered. When they were down to 10 men, with just two regular central midfielders, Italy resorted to complete defence. With just 10 minutes to play for, Uruguay captain Diego Godin converted a set piece to a brilliant goal. After that Italy planned some swift moves, but none of them could be converted. It was saddening to see even Buffon coming up to the penalty area of the opposition in an attempt to find that one goal which could secure them a place in the pre-quarter finals. But it wasn't to be, and the Italians were knocked out for the second successive time in the first round of the world cup finals.